Dakota Banks has written scifi and thrillers (under a different name) but turned to fantasy when she “felt hemmed in by reality.” She lives on the western fringe of St. Louis, Missouri with her husband and two cats. Their two sons, one adopted from Peru and the other from Ethiopia, are in college. Read an excerpt of Dark Time at Dakota Banks’ website. Mortal Path — (2009-2012) Publisher: Three hundred years ago, she sold her soul to a demon. Now she wants it back. For centuries, the woman calling herself Maliha Crayne has lived a second life — as an assassin for the malevolent creature who owns her soul. A haunted killer with the blood of countless victims on her hands, she has finally discovered a way to nullify the demonic pact that chains her: If she saves a life for every one she has taken, she will be free. But if she fails, her punishments will be unspeakable, unendurable… and neverending. 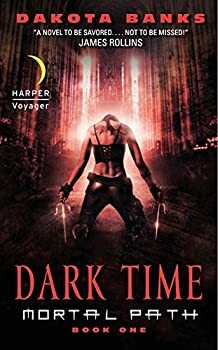 Dark Time by Dakota Banks is a technothriller disguised as an urban fantasy. For it to reach its ideal audience, it should instead be titled something like “The Anu Tablet” and have an ominously lit historic building on its cover.